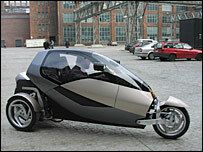 A tiny, three-wheeled car that could help solve city congestion has been demonstrated at the University of Bath. The prototype Clever (Compact Low Emission Vehicle for Urban Transport) car is one metre wide and less polluting than normal vehicles. 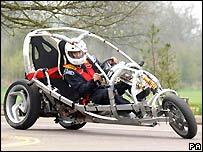 It has a top speed of 100 km/h (60mph) and uses a novel tilting chassis to make it safe and manoeuvrable. "The only solutions at the moment are motorbikes or cars" said Ben Drew, a research officer at the University of Bath, one of the institutions involved in the project. "The idea is to try to marry the small size and efficiency of a motorcycle with the comfort and safety of a standard car," he said. 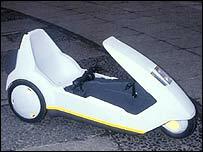 The finished vehicle looks like the big brother of the ill-conceived Sinclair C5. However, the Clever car may drive the field of alternative vehicles further forward than Sir Clive Sinclair's invention. The prototype on show in Bath was just a metal skeleton, but the complete car has a roof that protects both the driver and the passenger sitting behind in the event of a crash. The plastic panels, that sit on the aluminium frame, also protect the occupants from the elements. At just over one metre wide it is even narrower than Daimler Chrysler's original Smart car. The micro-mini is able to park efficiently and opens up the possibility of an increased number of lanes on jam-packed city streets. However, more cars should not mean more fumes, because the Clever car uses compressed natural gas. "It costs less to run, is quieter and is less polluting," said Dr Jos Darling, a senior lecturer in charge of the Clever project at Bath University. It would also allow the car to get around London's congestion charge. The team from Bath also had to design a novel chassis that keeps the narrow vehicle from rolling over when it turns corners. The hydraulic system is electronically controlled and automatically tilts the vehicle as it goes round a corner, in a similar way to a motorcyclist tilting a bike. "The control system takes measurements from the driver, such as the steering angle and speed, and tilts the vehicle to the required angle to go round the corner," explained Mr Drew. "It takes a little while to get used to, but once you do it feels bizarre to get back into a normal car." The car on display in Bath is one of five built by the EU consortium. Three were destroyed in crash testing and the other is in Germany with car manufacturer BMW, one of the organisations involved in Clever's development. Although the vehicle is packed with innovations, it is unlikely to replace SUVs in the affections of urban dwellers just yet. The prototype is purely a research project and is unlikely to come to market in its present form. But the researchers hope that car companies may build on its ideas, and that the design may even pave the way for a new class of city vehicles somewhere between motorbikes and cars. "You can imagine that they could re-jig the [London] congestion charge to just allow motorcycles and Clever vehicles, but not cars," said Mr Drew. "The idea is to showcase the vehicle and start the process of laying down the groundwork for this third way."